Mr. Denney is a native of West Virginia, and was born in 1861, the son of James and Sussian Denney. His mother, who was of German descent, was born in Ohio; his father of Scotch-Irish descent, was a native of Pennsylvania. The subscribers' early years were spent in his native state, but in 1873, the family moved to Illinois, and it was here that he spent the years of his youth, residing in Piatt county, near the town of Ivesdale. In 1883, just a year or two after Mr. Denney attained his majority, he came to Stanton county, Nebraska, and rented land, which he worked for himself. In a short time, he had the opportunity to buy land cheaply and purchased the farm which has been his home since that date. He has made extensive improvements, adding fences, buildings, planting trees, etc., and it is now as thrifty a place as can be seen in a day's journey. Mr. Denney was united in marriage to Miss Malissa Burtwhistle in 1886. Six children have come to bless their home who bear the following names: James, Alva, Earl, Emory, Mary, and Eunice. Mr. and Mrs. Denney are well-known throughout the county, and enjoy the respect and esteem of many friends. In 1894 to 1897, he served as a member of the board of county commissioners, although a republican, he was elected to the place by a splendid plurality, overcoming democratic opposition, which had hitherto carried the elections. He is also a member of the administrative board as trustee of the Pilger Methodist Episcopal church. Joseph Rotter, who resides on section twelve, township twenty-three, range five, in Antelope county, Nebraska, is one of the leading old-timers in this section who has always done his full share in the betterment of conditions throughout the community in which he lives. Mr. Rotter was born in Austria, September 23, 1843, and after attaining his manhood years was united in marriage in Braumseifen, Maehren province in February, 1868, to Miss Caroline Peshka Baker, also of Austria. In 1878 Mr. Rotter, with his family, left his native land for America, where land could be had cheaper, and where a young man with a family to support could have a better opportunity to get a start in life. After landing in New York in the fall of 1878, Mr. Rotter set his face westward, settling in Butler county, Nebraska, in the spring of 1879, where he remained six months, then came to Antelope county, Nebraska, taking up a homestead, on which he built a sod house in which he lived for seven years; he later built a frame house, and two days after it was blown down; he then rebuilt, and in July of 1895 this house was destroyed, and Mr. Rotter again built up a fine home. The family experienced many hardships in those early days and suffered privations and losses through all sorts of misfortunes; in 1894 the crops were almost a total failure from drouth, but they saved three hundred bushels of wheat, and in the years 1901 and 1902, the severe hailstorms destroyed the growing crops. But they have held on tenaciously and have prospered. Mr Rotter now owns four hundred and eighty acres, and his sons own one hundred and sixty acres of fine land. Mr. Rotter is the father of a family of ten children, whose names are as follows: Frank, Joe, John, Ernest, Theresa, Josie, Bertie, Carrie, Amelia, and Otilda. Theresa is now Mrs. M. Giehler; she has three boys. Josie, who is now Mrs. J. Beck, has three boys, three girls. Mr. Rotter and family enjoy the highest respect and esteem of a wide circle of friends and acquaintances, with whom they are surrounded in their pleasant home. Mr. Rotter is a substantial citizen, and is known in his community for his many good qualities. Mr. Rotter is a good democrat and a staunch Roman Catholic. In January 12, 1888, during the day of the severe blizzard, Mr. Rotter's children were at school. Frank his oldest boy and himself, went to bring them home facing the storm all the way and could keep the course only by following some grass that grew in the center of the road, they eventually got the children home safely. Robert R. Duncan, cashier and active manager of the Home Bank of Merna, Nebraska, is one of the most prominent business men of Custer county, where he has lived since 1888, with the exception of two years. Mr. Duncan was born in Buffalo, New York, February 17, 1857, the seventh child of James and Christine (Ross) Duncan, who were parents of six sons and six daughters. In April, 1857, the Duncan family moved to Ashkum, Iroquois county, Illinois, and located on an Illinois farm. Both parents were natives of Scotland and at the time of coming to Illinois they had five children. They lived in Iroquois county a number of years and the sons and daughters one by one left the home circle and started out in life for themselves, forming new ties and going to homes of their own. The mother died in 1885 and the father in March, 1908, the latter being then in his eighty-seventh year. isfied in the east, and came back to Merna in June, 1905, soon after which he helped in the organization of the Home Bank of Merna, since which time he has held his present position in this institution. The officers of this institution are all old time business men of Custer county and of recognized integrity and ability: N. Jacquot, former president, died in June, 1911; J. S. Francis, president; Mr. Kellenberger, vice president, and Robert R. Duncan, cashier and manager. This is one of the most important organizations of Custer county and has been influential in the development and upbuilding of the region. The bank now occupies a fine modern building, well adapted to the use for which it was erected, and containing suitable safety vaults, etc., for insuring the proper care of capital and depositis [sic], securities, and other valuables entrusted to the care of the institution. Mr. Duncan was married in Ashkum, Illinois, May 5, 1890, to Agnes McDonald, a daughter of Aleck and Catherine McDonald, natives of Scotland, but early settlers of Illinois. Both Mr. Duncan and his wife are the only ones of their immediate families who live in Nebraska. Her father died in Illinois in 1904, at the age of seventy-five years, and her mother died in 1909, aged eighty-eight years. Mr. Duncan is president of the Merna school board and is actively interested in progress along all lines. He is a member of the Ancient Free and Accepted Masons, and the Independent Order Odd Fellows orders. For over a quarter of a century Mr. E. D. Applegate has been identified with the agricultural interests of Antelope county, Nebraska, and he has aided materially in transforming this locality from its wild natural state into a thriving farming district. He is a gentleman of energy and perserverance, and has met with deserved success in his labors, now being classed among the leading citizens of his community. Mr. Applegate is a native of Harrison county, Indiana, where he was born January 30, 1855; he is the son of Robert and Marinda (Jacobs) Applegate. His mother died April 7, 1878. His father was born in 1823 in Pittsburg, Pennsylvania, and died January 7, 1869. Our subject's grandfather came from Holland. His mother was a native of Indiana. Our subject was but fourteen years of age when his father died. Mr. Applegate was united in marriage February 8, 1881, to Miss Louisa Hays. Mr. and Mrs. Applegate are the parents of five children, whose names are as follows: Mattie M., who is now Mrs. Moore, and resides in Clearwater; Dolly E., who is married and lives in Clearwater township; Evert, William, and Hazel. Mr. Applegate moved to Washington county, Iowa, in 1874, remaining there ten years; then after his marriage, came to Clearwater, Antelope county, Nebraska, October 9, 1884, where he took up a homestead and tree claim in section seven, township twenty-four, range eight, which is his present location. Here he and his family reside and enjoy the respect and esteem, and friendship of all in their community. Mr. Applegate has built two sod houses on the old homestead farm, but later built a beautiful home which he and his family now occupy, a picture of which appears on another page of this volume. 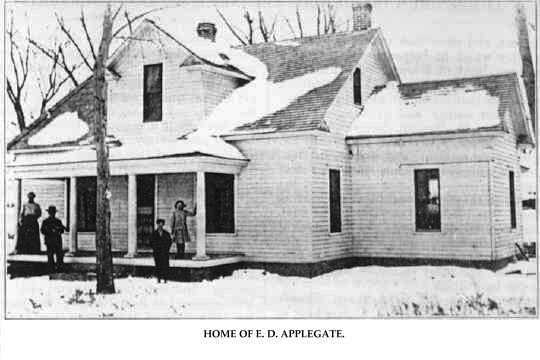 Home of E. D. Applegate. Among the younger pioneers of Custer county, Nebraska, may be mentioned Ulysses Grant Brown, a native of Switzerland county, Indiana, born May 31, 1871. He is a son of John G. and Martha Ann (Tucker) Brown, the former a native of Ohio county, Indiana, born August 10, 1840. They were married at Bear Branch, Ohio county, August 24, 1862, and of this union four sons and seven daughters were born. In the fall of 1872 John G. Brown removed with his family to Danville, Illinois, and in the fall of 1883 to Polk county, Nebraska, coming to Custer county two years later. In the latter part of 1885 he secured a homestead on section fourteen, township fourteen, range nineteen, Loup township, Custer county, where he resided until his death, which occurred August 20, 1904. He was survived by his widow and little children, all of whom are now living. With the exception of two daughters, one in the state of Washington and one in Council Bluffs, Iowa, all the children reside in Nebraska. Mrs. Brown makes her home in Garden county, Nebraska, where two of her sons reside. In 1872 Ulysses G. Brown accompanied his parents to Vermillion county, Illinois, in the fall of 1883 to Polk county, and two years later to Custer county. In 1893 he secured a homestead on the south half of the south half of section fourteen, township fourteen, range nineteen, thus becoming one of the original homesteaders of Custer county. Since early manhood he has been identified with the farming and stock-growing interests of his part of the state and is considered a progressive man along all lines. He was but fourteen years of age when he came to the county and has spent most of his life within the state. He is actively interested in local affairs and gives his support to various public project for the advancement of the general Prosperity. His father was an influential citizen and served two terms (1898 to 1902) as county coroner. still reside in Custer county. Mr. Brown and wife have three children, all born on the homestead: Guy Floyd, July 21, 1897, Mary Ruth, March 25, 1900; Charles William, August 22, 1907. Mr. Brown is independent in politics and a member of the Modern Woodmen of America. He has enjoyed the privileges of pioneer life, living in a "soddy" since coming to Nebraska, until 1909, when he erected a substantial concrete block cottage on a well selected location. A few years later a well-built barn was added to the improvements of the place, which is known as Cat Creek ranch, of which we show an engraving on one of our illustrated pages. 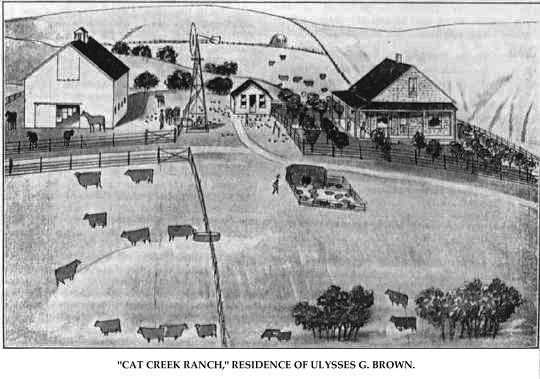 "Cat Creek Ranch," Residence of Ulysses G. Brown. William O.Trotter, manager of the Atlas Grain Company's elevator at Osmond, has known life in at least four of the states in the Mississippi valley. He was born in the north part of Wayne county, Illinois, March 17, 1864. His parents, Shirley and Elizabeth (Reed) Trotter, natives of Kentucky and Illinois, respectively, were of Scotch.Irish descent, their ancestors having settled in colonial times in the Allegheny and Blue Ridge mountains. For a few years during the early seventies, his parents, lived west of the Mississippi, farming for a season in Buchanan county, Missouri, near St. Joseph, followed by a season in Clay county, Arkansas, near Cherokee Bay, and another in Ripley county, Missouri, before returning to Wayne county, Illinois, where Mr. Trotter resided until coming to Nebraska in May, 1884, to join a brother who had preceded him to Brown county in the fall of 1882. Here Mr. Trotter pre-empted an eighty-acre tract three miles north of Long Pine and a year or two later traded his equity in it for forty acres near town. For a year or two he "batched" it on rented land, a part of the time that of his future father-in-law. After marriage in 1888, he lived in part of the house with Mrs. Trotter's parents and rented the farm for three years. He then bought the relinquishment to a quarter-section three and one-half miles west of Long Pine, on which he lived nine years. Owing to the ill health of Mrs. Trotter they sold the place and came to Osmond in 1900, intending to buy land, but invested the proceeds of the sale of their Brown county farm in three or four houses and lots in the town, in which they have at all times a good class of tenants, and keep their tenements in an excellent state of repair. Mr. Trotter was first employed as a carpenter at Osmond, and later was for four years engaged by the W. O.Snyder Lumber Company, of O'Neill and continued with their successors, the Saberson Brothers, of Allen, Nebraska. During this time Mr. Trotter frequently acted as helper for the manager of Ole Atlas Grain Company, familarizing himself with the business, and at the same time establishing a reputation for efficiency and integrity. On the promotion of the local manager to the auditorship, Mr. Trotter was recommended for the vacant place early in August, 1907, and except for a few weeks interim, owing to a misunderstanding in the general office, he has been in continuous charge ever since. The affairs of the company have prospered under the management of Mr. Trotter and his books, and accounts are always ready at a minute's notice for the examination of the auditor. He has familiarized himself with all phases of the grain business, and makes himself agreeable to the producers of the surrounding country. Mr. Trotter was married near Long Pine, to Miss Addie B. Stockwell, who was born in Iowa, February 27, 1867. She is a daughter of Francis E. and Eliza (Hale) Stockwell, who settled in Brown county, Nebraska, in 1879; they were natives of Vermont, where they were married, and came west in 1865 or 1866, living in Webster county, Iowa, until migrating to Nebraska, as stated before. When first settling on their claim, the nearest railway terminus was Neligh, eighty-five miles distant, and here they had to drive across the open prairies to market and trade. Charles O.Trotter, brother of the subject of this sketch came to Nebraska in the spring of 1892 and lived for few years near Long Pine. In 1903 he removed to Wisconsin, where he lived for three years, and returned to Nebraska, settling in Osmond in August, 1906. He married Miss Winifred May Stockwell, sister of Mrs. W. O. Trotter, September 2, 1893. They have a family of five sons, Loren, William, Albert, Charles and Elmer. Returning to Wisconsin in 1910, with his father-in-law, they purchased land in Rusk county where they intend to make their permanent home. W. O.Trotter is a republican, though as a protest against corrupt party machine politics he voted for Weaver and twice for Bryan in the last campaigns of the nineteenth century. During the blizzard of January 12, 1888, Mr. Trotter was "keeping batch" on the Sprouse farm north of Long Pine, and prudently kept to the house until the storm was spent. Antelope and deer were plentiful there when he first came to the west and he had the excitement of catching the first antelope he ever saw. His brother and a neighbor had been running it on their horses; exhausted, it threw itself down in the yard of his ranch when he ran to it and held it down until the others came and finished the chase. shelving were found on the farm of his brother, William O.Trotter, seven miles away. Those early experiences are interesting topics of conversation now, but were sources of extreme hardship at the time they transpired. Jorgen Christensen, one of the prominent pioneers of Howard county, Nebraska, has a fine farm in Dannebrog precinct, and is a worthy and highly esteemed citizen of his community. He is a prosperous and successful farmer and stockman, and only another of those sturdy immigrants who came from their native land and by dint of thrift and perseverance have built up for themselves comfortable homes and become respected by their fellowmen. Mr. Christensen was born in Denmark on September 28, 1846. he is a son of Christen and Annie Jorgensen, and the third child in order of birth in their family of eight, both parents now being dead. In 1873, our subject, one brother, and two sisters, came to America, coming directly to Nebraska, and landing in Dannebrog, Howard county, on June 27. Jorgen homesteaded on section four, township thirteen, range eleven, about two years after settling here, and still owns this eighty-acre tract which is the home farm. Later on, he acquired one hundred and sixty acres on the Loup River bottoms which he still owns. In all he owns about half a section of choice Howard county land, which is improved in first-class shape, and he is regarded as one of the wealthy residents of his section. Mr. Christensen was married in Grand Island on October 14, 1878, to Annie Sorensen, and they have eight children, who are named as follows: Niels C., Metta, Jens P., Christen L., Frederick, Annie, Viggo and Elmer, the first two mentioned married and settled in Nebraska, while the rest are living at home with their parents. Mr. Christensen has always been active in local affairs, doing his full share in the upbuilding of his community. He has served as road overseer in his township, also for many years was moderator of district number seventeen. Horace M. Davis, editor and proprietor of the Ord Weekly Journal, and prominent in educational and political circles in that part of the state, is said to be the first white child born in Greeley county or in the North Loup valley north of St. Paul, in Howard county. He was born September 14, 1873, the oldest of three children born to Mansell and Mary Davis, who came to Greeley county in 1872. A sketch of Mansell Davis appears elsewhere in this work. In early boyhood Horace M. Davis received the advantages of a district school education, later attended high school at North Loup, from which he graduated with the class of 1891, and then began teaching in the Fish creek, (Greeley county) school. Later he taught in his home district number three and in the fall of 1892 went to Milton (Wisconsin) college, where he studied one school year. Then, returning to Nebraska, he taught school one year in Manderson village, after which he spent another year in Milton college and taught one year in the public schools of LaCrosse, Wisconsin. He spent the summer of 1894 in Colorado and upon his return to Nebraska accepted the position of principal of the Elba village school in Howard county, which he held one year, and during the school year of 1895-1896 taught the North Loup school. For several years Mr. Davis devoted his vacation time to study and in 1897 became an A. B. graduate of the Lincoln Normal school. In the fall of that year he became principal of the Ord high school which post he held during 1897-1899. He had been for several years connected with institute work in different counties during the summer months, and in the fall of 1899 he was elected clerk of the district court of Valley county, which office he ably and creditably filled a four-year term. In October, 1900, Mr. Davis entered upon his journalistic career, purchasing the Ord Weekly Journal, of which he remained editor and proprietor until November, 1901, when he sold his interest in the paper and began traveling as special agent for a fire insurance company. In 1902 he purchased an interest in a real estate and insurance business in Ord, remainig [sic] in that business until January 1, 1905, when he again purchased the Ord Weekly Journal, of which he has since been the owner. He has a well established paper and a well equipped plant for its production and issue. He is a democrat in politics and is much interested in questions affecting the public welfare and prosperity. Since 1906 Mr. Davis has been press agent for the Redpath Chautauqua system, and during the years 1909-1910 served as secretary of the Nebraska state senate. He is a member of numerous orders and lodges and is a progressive young man all along the line, having been closely identified with the North Loup valley and its interests since reaching manhood, and being a patriotic son of Nebraska. July 17, 1901, Mr. Davis was united in marriage with Miss Besse Fackler, at the home of her father, Samuel Fackler, in Ord. Two children have blessed this union, Mansell and Keith. Among the old settlers and prominent residents of Norfolk, Nebraska, the name of Gay Halverstein deserves a foremost place. Mr. Halverstein is well known all over the northeastern part of Nebraska as an upright public-spirited citizen. dren, two brothers residing in South Dakota, and two sisters in Norway. Both parents are deceased. In the spring of 1869, Mr. Halverstein came with his elder brother to America, the brother locating in Sioux Falls, South Dakota, and Mr. Halverstein coming on to Nebraska, where he worked at railroading for the Northwestern railroad company. In the summer of 1871, he located at Wisner, and the same year homesteaded one hundred and sixty acres of land near Battle Creek, Nebraska, relinquishing the same a couple of years later. In 1879, when the Northwestern railroad pushed on to Norfolk, Mr. Halverstein located in that city where he has resided through the years, and since his residence in America has been identified with the Northwestern railroad. On February 20, 1882, Mr. Halverstein was joined in wedlock to Miss Jennie Long, of the state of Illinois, and they are the parents of three children, who are named as follows: Lester B., resides at home; Verne L., deceased July 4, 1893; and Ruth, who lives at home. Mrs. Halverstein's parents are deceased, and she has one brother and one sister in the state of Illinois, one brother in Iowa, and one sister in Missouri. Our subject, Mr. Halverstein, has served several terms on Norfolk city council. In 1898, he purchased a fine home where they now live, always showing the desire to assist in the advancement of his home community. Mr. Halverstein is a pioneer railroad man of Nebraska, and has passed through all the experiences of frontier life, and is one of the well known and successful men of this locality. One of the most prominent citizens of Ansley, Nebraska, is the above named gentleman, who has for many years been a resident of Custer county. For more than a quarter of a century he has been closely identified with the agricultural interests of this section, and has won the esteem of all with whom he has come in contact. Mr. Zimmerman was born in the village of Wellersburg, Somerset county, Pennsylvania, on October 9, 1851, and was the third of eight children born to Louis F. and Elizabeth (Holdseider) Zimmerman. Of this large family, only three of the children have passed away in all this lapse of years. Both parents were of German birth; the father, a native of Anhalt-Katen, died in Pennsylvania in 1881, while the mother, who came to America at the age of sixteen, passed away in Custer county, Nebraska, in December, 1906. Our subscriber went with his parents to Mahaska county, Iowa, in early childhood, and it was here that he grew to manhood years, receiving his education in the local schools. Later, he engaged in brick making and stone cutting in Oskaloosa. It is a notable fact that he moulded and burned the first brick used in Broken Bow, firing the kiln with dead cedar branches and hay. In the spring of 1879, he came to Custer county, and took up a homestead of one hundred and sixty acres, near the town of Mason, and this remained the home place for about thirteen years. At the same time he also took up a timber claim, comprising another nearby quarter-section. In the year following, 1880, Mr. Zimmerman was united in marriage to Miss Anola J. Amsberry, a native of Marion county, Iowa. Her parents, Louis Norton and Jane (Coffman) Amsberry, were natives of West Virginia. The father died in 1876, and Mrs. Zimmerman came to Custer county, with her mother, four brothers and little sister, in 1879 an older brother having preceded them. Mr. and Mrs. Zimmerman are the parents of seven children: Louis Ray, now married and living near Berwyn; Thomas E., married and living near Ansley; Addie E., now Mrs. Garfield F. Eggleston living near Ansley; Lottie J., now Mrs. Aaron Staab, residing near Ansley; Frona, now Mrs. J. W. Parkhurst, of Omaha; Mabel J., now Mrs. Ray Lewis, living near her parents home, and Flora, still at home. Mr. Zimmerman has always engaged extensively in diversified farming, and has also paid considerable attention to stock raising. In 1906 the family moved to the town of Ansley, where he built a comfortable home. After four years of town life, however, they returned to the farm just outside the northern city limits, where they now live. They have a well improved and well equipped farm of one hundred and thirty acres. Mr. Zimmerman has always been much interested in educational affairs, and was instrumental in organizing his school district, number thirty, and for some years served continuously, either as director or treasurer. At the time he sold his farm near Mason, he purchased a half-section near Berwyn, and lived there about six months. This was just before his removal to Ansley, which was made almost entirely because of the better educational advantages in the latter place. Mr. Zimmerman never killed deer or antelope in the early days, being a farmer instead of a hunter, but when Jacob Cover, a noted pioneer, brought down big game, he usually came for Mr. Zimmerman to haul it home for him. For a short time Mr. Zimmerman and family lived in a dugout, and for some years after in a "soddy," before erecting a frame dwelling. At the time of the blizzard of October, 1880, Mr. and Mrs. Zimmerman were visiting her mother and were compelled to remain until the third day, their stock enduring without feed and water for two and a half days; they had eaten the mangers and hay roof of the barn during the time. Mr. Zimmerman and family are members of the Baptist church. In politics he is independent, and is a member of the Modern Woodmen of America. The gentleman named above, a prominent early settler of Dannebrog township, is well known and highly esteemed because of his industrious habits, by which he has built up a comfortable home and acquired a valuable estate. His farm is on section thirty-three, one and a half miles northwest of Dannebrog. He is a leading citizen in local and school affairs. Niels M. Madsen was born in Denmark, on May 11, 1837, and grew up in that country. His young manhood was spent in farming, and after the manner of the people of his class and county. He was a hard worker and saved considerably from his labors and was thus enabled at last to come to America, from which place had came to him glowing accounts of the opportunities afforded the emigrant to accumulate a competence. He left his native land in 1878, spent two years in New Jersey and in 1880 proceeded westward locating in Howard county, Nebraska. In coming to this country he was accompanied by his wife, who was formerly Johnannah Larson, they having been married in 1876, and together they began the work of establishing a home for themselves. Mr. Madsen filed on a homestead on arriving here, and this was their continuous residence until the spring of 1910 when he moved to Dannebrog village. He has added to his original farm considerably, and has improved all his land, also has fine farm buildings and equipment of every sort. Mr. and Mrs. Madsen are the parents of five children, four now living, as follows: Mads Madsen, who is married and lives with his family in California; Niels Madsen, also residing in that state; Louis C. Madsen, married and living in Cotesfield, engaged in the banking business, and Theodore Madsen, who is at home with our subject, assisting in the operation of the home farm. One of the best known and most prosperous retired farmers to be found in Merrick county, is Mr. John M. Kyes, of Central City. He is also to be numbered among the oldest settlers, having come to Merrick county in August, 1862. On Christmas day, two years later, he married Miss Viola Parker of New York state, and they enjoy the distinction of being the first couple married in that County. Mr. Kyes, born in Oswego county, New York, on February 4, 1839, was the eldest of three children born to Russel and Nancy Colgrove Kyes. Mr. Kyes grew up to manhood in New York state and remained there until about 1855, when he went to Iowa. He remained there until the spring of 1860, when he again joined in the never-ceasing westward movement, going this time to Denver, Colorado. He remained here two years, prospecting for a time, afterwards driving on a stage line. When he first came to Merrick county, Mr. Kyes drove for the Western Stage company for about two years. A short time after his marriage, Mr. Kyes and wife moved to a farm south of Chapman Station, which was their home for several years. About 1871, he took up a homestead of eighty acres on Prairie Creek, later purchasing three hundred and twenty acres adjoining. For many years, this place was the "old home place," but in 1900, Mr. Kyes decided to retire from active management of the farm, and removed to Central City, where he purchased a comfortable home, where he still resides. Mr. Kyes was instrumental in organizing his school district number twenty-three, and for four years served as treasurer of same. In many ways, Mr. and Mrs. Kyes have materially aided the progress of education in this locality. As has been said before, they are among the earlier settlers of Merrick county, and like all, have lived through the many discouragements, incident to pioneer life on the Nebraska prairies. Indian troubles did not dismay them, neither did drouth, blizzards nor grasshopper plagues cause them to lose their courage. They are now enjoying their well-earned rest, after a life of toil. Mr. and Mrs. Kyes have had ten children, seven of whom are living. The names of those still living are as follows: Mary L., Ella M., now Mrs. Eugene Wickham, of Furnas county, Anna, now Mrs. Willard Halsey of Nance county, Nebraska; Allie, now Mrs. Benjamin Lance of Chapman, Nebraska; Russel J., and John H., and Jessie. The last two named are twins. On account of their, long residence in Merrick county, Mr. and Mrs. Kyes have had the opportunity to gain many friends, and the family is widely and favorbly known. The Dominion of Canada has contributed a high class of citizens to the state of Nebraska, and coming of a race that for centuries has held law and order the essential foundation of state, they are always found earnestly supporting the authority and recognized representatives of the people. skill, strength, and fortitude. Of these the Jennie Bull, and the Big and Little Bull Falls were notable. Occasionally ladies were ambitious of distinguishing themselves by going with a raft over the falls, usually resulting in a soaking and a ruffled temper. One winter, when about fifteen, Mr. Derig was engaged in rafting on this stream, and for a period of over thirty days did not know the feeling of dry clothing, being soaked more or less with the icy water for that length of time. In March, 1889, Mr. Derig came to Holt county, Nebraska, and bought land near the Niobrara, near Chelsea, in Holt county, where he lived until the opening of the reservation in Boyd county to white settlement. In September, 1891, he filed on a homestead two miles south of Butte, on which he proved up and then sold, investing the proceeds in a quarter section adjoining the county seat to the south. The land is beautifully situated and comprises within its boundaries two of the buttes from which the town takes its name. It is fertile, and although Mr. Derig had not been familiar with farming operations prior to coming west, he has become a successful farmer and stock raiser. Since 1896, he has been in the rural mail service, traveling two hundred miles per week, which makes his aggregate mileage in the service upwards of one hundred and fifty thousand miles. Mr. Derig is a son of James and Hannah (McGovern) Derig, the father, a native of Ireland, who came to Canada when sixteen years old attained the age of eighty-eight years; while the mother, born in Canada, attained the same unusual span of life. Mr. Derig was married in Wausau, Wisconsin, July 28, 1882, to Miss Jennie O'Neal, who was also a Canadian by birth, a daughter of Phelam and Ann O'Neal. Four children were born to them, three of whom are living. They are: Geraldine, who is the wife of Ross Carmichael and lives five miles southwest of Butte; and Geneveve and Wilnetta. Mr. Derig fraternizes with the Masons, the Modern Woodmen, and the Brotherhood of American Yoemen, and, with his wife, is a member of the Order of the Eastern Star. Like most early settlers, Mr. Derig has experienced life in a sod house, his first dwelling in Boyd county; and, like others, he found a a most comfortable habitation, but later built a good frame house. He burned corn but one winter, although prices for farm products were very low. He sold one thousand two hundred bushels of wheat one season at twenty-eight cents per bushel, and the purchaser probably made little at that. The coming of the railroads made conditions better, and now, with the modern methods and fast trains, they take the products of the Nebraska farmer to the seaport and to the markets of the world with facility and ease. Like Mr. Derig, those who came early to the west and endured the privations of the frontier have prospered far beyond those who have remained in more physical comfort in the east. James N. Baker, son of Hiram and Martha (Gatty) Baker, was born in Virgil, New York, July 22, 1834. In February, 1857, Mr. Baker was joined in holy wedlock to Miss Martha Brown, also of New York state, who for many years had been a teacher there. Directly after their marriage they went to Iowa, engaging in farming until 1878 when they came to Boone county, Nebraska, and homesteaded one hundred and sixty acres and timber-claimed one hundred and sity [sic] acres adjoining, on timber creek. This place remained the home until 1879 when Mr. Baker retired from farm life and moved to Cedar Rapids, purchasing a good home where he lived until the time of his death December 31, 1906, survived by his wife and six children: Mabel H., who is married to D. C. Stafford, and lives in Omaha; Frank N., is married, has three children and resides in Lincoln, Nebraska; M. S., is married, has six children and lives in Lincoln; Mary M., is married to O. L. Judd, has one son, and resides in Cedar Rapids; Mattie J., is married to K. O. Hess, has three children and lives in Riverton, Iowa; and William H., who is married, has two children, and lives in the state of Wyoming. Mr. Baker was one of the earlier settlers, alive to the best interests of his county and state, and helpful in many ways in his community. In the early days he was for many years a member of his school board, the Baker school bearing his name. Mrs. Baker is still living in the Cedar Rapids home surrounded by a large circle of friends. Perseverance and integrity are the stepping stones by which many men have reached success. but of the early settlers in the west these characteristics were required in a greater measure than usually falls to the men of a more settled region. Andy Hopkins, an agriculturist of prominence in Antelope couny [sic], Nebraska, resides in Blaine precinct, and is one of those substantial citizens whose integrity and industry, thrift and economy have added so much to the material wealth and growth of Nebraska.